Thanks to those who attended our Homeless Youth Forum on June 27, 2017. 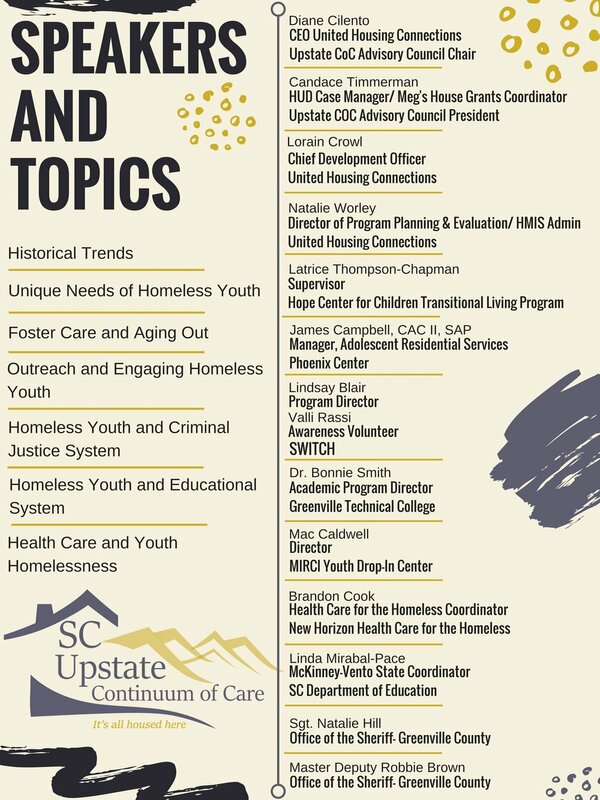 One of the outcomes of this very informative event was a consensus for the need of a youth drop-in center in the Upstate. If you would like to be a part of planning and/or developing this initiative, please complete the form below. Missed the Homeless Youth Forum? To ask Latrice Thompson-Champman of Hope Center for Children a question, email her here. Download slides from Natalie Worley of United Housing Connections here. Download slides from James Campbell, CAC II, SAP of Phoenix Center here. Download slides from Dr. Bonnie Smith of Greenville Technical College here. Please note: Speakers and topics are subject to change.